A book in a series that looks at different periods/ backgrounds in Welsh history, on which the story is based; this story is about sailing days on the Welsh coast. With Captain Dan and the Ruby Ann, the sixth in the Stories of Welsh Life series for 8–12 year-olds, author Siân Lewis has once again succeeded in producing a tale from a child’s perspective – which not only brings to life the joys and tensions of young Daniel Davies day-to-day through a first person narrative, but also provides an economic and social flavour of the sometimes overlooked maritime trading tradition which coexisted with agriculture along the Welsh coast. This is Dan’s individual story and his family’s and a glimpse of how a community functioned in the nineteenth century; at the same time, it is a succinct rite of passage with a nail-biting conclusion. The heightened naturalism of Graham Howells’ muted illustrations, which appear on alternate pages with the text, provide the visual background of the story. Young readers will see artefacts, such as the photograph portrait of bewhiskered Dad-cu, Captain Dan, on the mantelpiece flanked by the scrimshaw work plaque of his wrecked ship Mattie and the conch shell souvenir of his travels. They will also see the hurly burly of New Quay shore with its ship building, household and ship-board interiors and atmospheric scenes at sea. At the same time, Howells portrays character, captures and exaggerates expressions and presents relationships through body language, bringing out elements of pride, joy, jealousy and resentment. This all serves to engage the inexperienced and motivate them to read on to satisfy their curiosity as well as aiding more confident readers to read between the lines. 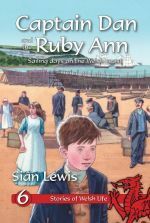 Twelve-year-old Daniel Davies not only follows the grandfather whose name he shares into a life at sea, but also carries the hopes of his grandmother, who has invested her savings in the building of the ship Ruby Ann. Rumour has it that Daniel’s grandfather wrecked the Mattie for the insurance money, and when Daniel becomes a crew member on the Ruby Ann, there are those who believe superstitiously that she, too, will sink. Bound for Belgium with Swansea coal, Dan is awoken to panic as fog has engulfed the ship: ‘Now there was no star, no sky, no sun. Even the sea had disappeared, and the ship was twitching and creaking like a scared thing.’ Desperate fear and tension are made real by the author as a foghorn booms out of the darkness ‘too close for comfort’ and the men can only shout to survive as their own foghorn is broken. Can Dan’s quick thinking and the good luck charm shell Mam-gu gave him from his grandfather’s memorabilia serve to save the ship and Captain Dan’s good name? Read this excellent, gripping book to find out!